These tartines (open-faced sandwiches) have become a staple in our house … in fact, they were our Christmas morning brunch this year. The cool thing is, they come together in about five minutes if you have some braised kale on hand; 15 or so if you’re starting from scratch. Heat 1 tablespoon oil in a large, deep sauté pan over medium heat, and add garlic. Sauté for 1 minute, or until fragrant. Add kale and vegetable broth to pan, season with salt and pepper, and toss well to coat. Cover pan, reduce heat to medium-low, and cook for 8-10 minutes, tossing occasionally, until kale is crisp-tender. 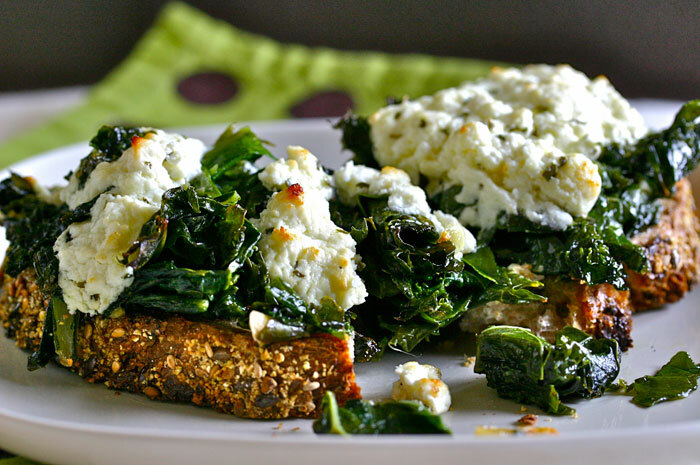 While kale is cooking, mix together feta, oregano and remaining 1 tablespoon oil in a small bowl. Set aside. Remove lid and increase heat to medium-high. Continue to cook for 3-5 minutes, until any remaining liquid has burned off and kale is tender but still vibrant. Season to taste with salt and pepper. Mound kale onto bread and spread cheese mixture on top. Broil for 3 minutes, until cheese is bubbly.